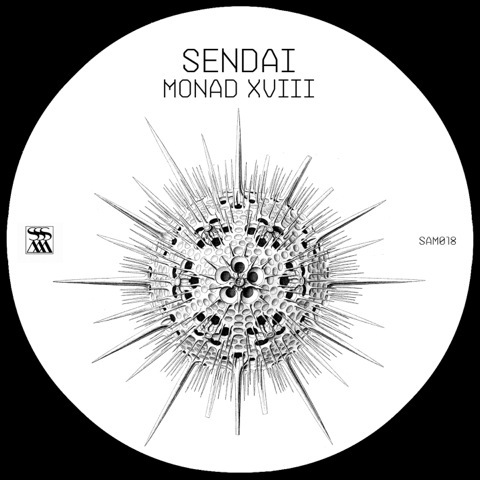 Peter Van Hoesen and Yves De Mey's joint project, Sendai. The 18th edition of the Monad series finds them in fine form, exploring a rich and detailed sound with limitless freedom. Opening track 'Isobaric 3' is thick with atmosphere, crammed with reverberating percussion and masterfully sculpted with 3-dimensional design. 'False Entities', the EPs most abstract offering, combines machine hiss with unnerving bleeps and metallic perc. In techno terms, 'Directive' is an epic. Beginning and ending with washes of ambience, the middle section breaks down into a repeating, tight bass sound. The most obvious dancefloor cut is 'Martens' Deficit'. Its drums are more rigidly structured than the other tracks, and pump away below brights synths and an energised high-end. 'Martens' Deficit' is an incredible end to an EP that fully lives up to the high expectations that surround both its makers.